VERIFY I-9, LLC is a full-service Form I-9 consultancy. In addition to I-9 audits and E-Verify©, we offer a number of services to ensure that your employees are authorized to work in the United States and that your I-9s will withstand the scrutiny of a government audit. Acquisitions – Buying an existing business? Don’t buy their unauthorized workers and defective I-9s! 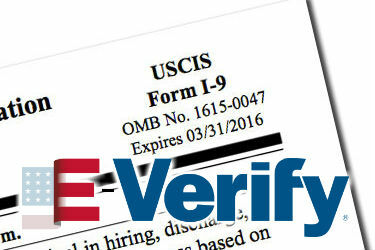 E-Verify® is the most effective tool for ensuring that your new hires are authorized to work in the United States. Applying for a business license or receiving a public contract? Our E-Verify service satisfies state laws and federal contractor rules that require E-Verify verification to qualify for public contracts or to maintain business licensing. We pride ourselves on prompt, personal service. When our client companies call, a live person answers the phone… usually one of the owners or a high-level manager. We have made E-Verify easy for thousands of employers from across the country! Are your Form I-9s error free? The large majority of forms that we see every day contain at least one error and some, a half-dozen or more! If targeted by the USCIS for a random audit of employment documents, your company can be fined between $200 and $2,500 per form, depending on the number and severity of the errors. It pays to have your forms reviewed by an experienced professional. A growing number of corporations including Fedex and Publix Super Markets are requiring contractors to provide a third-party Form I-9 audit and/or proof of enrollment in E-Verify. A large number of employers have relied on our service to meet this requirement. 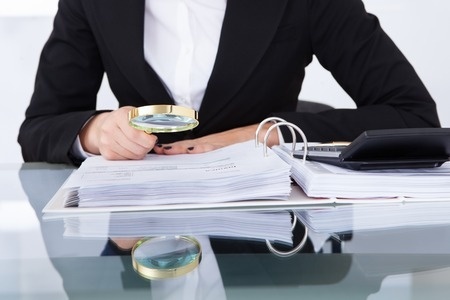 Receive more info about Verifyi9's Form I-9 audit services. Check your inbox or spam folder for the information you requested! While rapid advances in digital communication have made it possible for businesses seeking the most qualified candidates to pull from a nationwide labor pool, government forms like Form I-9 have not kept up with the progress. Form I-9 must still be completed manually; a company representative must meet face-to-face with the new hire to review original identification documents. Employers who violate federal law by accepting identification documents by email or fax face fines in the tens of thousands of dollars. Verify I-9 makes the processing Form I-9 for remote employees easy! Is E-Verify Required in Your State? Numerous states including Georgia, Texas, Alabama, Mississippi, Arizona, South Carolina and Utah require employers to enroll in E-Verify. Do you need an “E-Verify ID Number” or “federal work authorization user identification number” and have no clue what it is? We have answers! Our nationwide network of experienced professionals can complete and verify Form I-9 for your remote new hires. Check your inbox now for the information that you requested. If you don't find it there, first check your spam folder.